This time we focused on Field Papers, a great way to get a group mapping with OpenStreetMap without a lot of computer time. More on FP here. If you’re just getting started and looking for info on how to choose a venue and promote your event, try this from Learn OSM guide or this on hosting one from Missing Maps. Times are approximate, we had such a good time chatting to people that we ran about 15 minutes over. There was some expected futzing with the projector setup for the presentation so we started slightly late. The session was only open to NERTS and presumed no mapping experience. NERTS are trained to have a sharp eye for assets and hazards in their surroundings, the data targets (see below) reflect that. This two-hour workshop will show you how to start editing OpenStreetMap to add or verify features relevant to NERT. Resiliency maps store information about assets, resources and hazards in a given area. They can be printed and housed offline – a crucial advantage when electricity and connectivity may down or disrupted for days. OpenStreetMap is a collaborative project to create a free editable map of the world, often called the Wikipedia of maps. Requirements: No previous mapping experience necessary. We’ll be walking outdoors for a portion of the workshop, so layer accordingly. Optional: Create a free OpenStreetMap account and bring the credentials with you. Time permitting, we’ll upload edits to personal accounts. Write-ins (on a limited basis!) There were a fair number masonry buildings, warehouses, etc. These are all building tags in OSM that would be useful for a Resiliency Map as well as damage assessment. 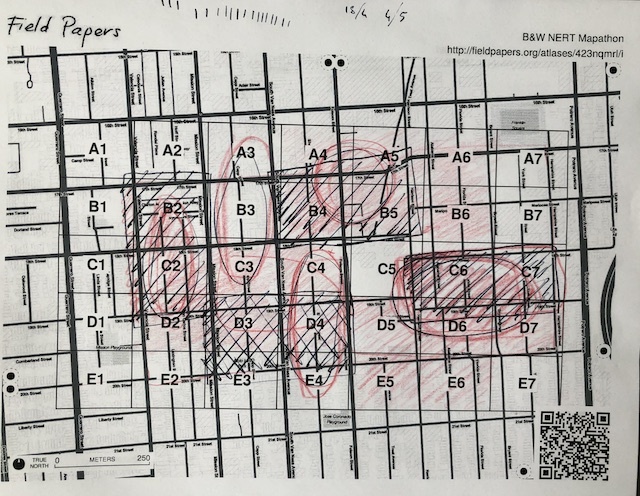 Along with the map squares, teams had a brief key for the targets (example: soft story=SY) that reminded them to note the target address for accuracy. Scout(s) Fast walker who goes ahead, decides direction. Some of these blocks had a lot of targets, others had little. Who’s running this thing, anyway? Three of us ran the workshop. One person gave the overview presentation and basic training. During the presentation, the field coordinator divvied up maps in a checkerboard pattern (so mappers wouldn’t overlap) and prepped the clipboards with map squares and a key. Once the teams formed, we answered some final questions and they were off! The third person, the OSM editor, used the field time to set up and when the first teams came back, photographed the maps and started uploading edits. The OSM editor had a cheat sheet with preset tags based on the data targets, write-in options and San Francisco’s Department of Building Inspection’s soft story list for verification. The other two people also had laptops and this material, too. As the teams trickled in, the other two fielded questions, collected clipboards. Once the teams were all back, the OSM editor walked the participants through a set of edits from Field Papers to OSM upload. Overall, the division of tasks worked. Next time it’d be wise to recruit one of the participants to take pictures for blog posts/social media. That was the one thing we were too busy for! As expected, we uploaded only a sample of edits during the workshop. We split up the remaining Field Papers, decided on a hashtag for the changesets (#NERTmapathon) so we could both track the edits and then contact participants and show them the complete output. There are a number of tools you can use to visualize your changesets, check out the filter from the indefatigable Pascal Neis (screenshot above), OSMCha and Whodidit.